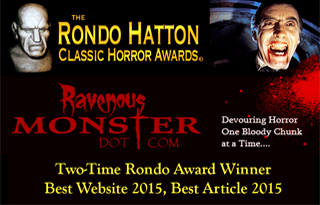 Ravenous horror humorist, Billy Boyce is back with more amusing musings on the latest genre output…. When I heard this movie was in pre-production, I was stoked. When I heard that the West Londoner, and motion capture expert, Andy Serkis was on board, I cried tears of joy. When I heard Marky Mark Wahlberg was NOT in it, I sacrificed my only son to the Dark Lord himself, for that was our agreement. Including the melted face of John Lithgow, there were only a few actors I recognized. There’s Harry Osborn from the Spider-man franchise [Oscar Nominee James Franco – Ravenous Editor], and that little punk Draco Malfoy (Tom Felton) from the Harry Potter empire (He totally gets the 187 by a chimp, in a pretty rad manner). Don’t worry; I’m not ruining anything for you. As soon as he appears on screen and opens his mouth, you know he’s going down. I was a little disappointed that there were no plot twists, so just seeing an advertisement for Rise of the Planet of the Apes is like watching a visual Cliffs Notes cheater. I’ve decided to leave out as much about the story as I can so that you can have at least a little something to discover. Though, on a positive note, it is a brand new story, no sequel, no remake. That being said, the apes can talk like in the other films. Once they get the plot device miracle drug into their systems, they open up and blab like teenage girls on the phone. There is one BIZARRE scene where the apes sit around in a circle and see who can do the best Christopher Walken impression. OK, none of that is true, just a fantasy of mine. The apes in this film do not outright converse, but they do communicate in different ways, and at different levels. So where did they get all these apes? The answer lies down under at Weta Digital in Wellington, New Zealand. Weta Digital is the five-time Academy Award winning digital effects house that brought to life some of our favorite movies, including The Lord of the Rings trilogy, King Kong, and Avatar. 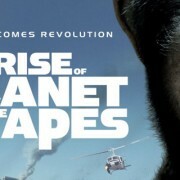 I can honestly say that the special effects in Rise of the Planet of the Apes are among the best the world has seen. The simians in this film make Gollum look like Garfield. Although Weta Digital did the effects for LOTR and Avatar, those movies are now dated due to the digital dominance in “Rise.” When the protagonist and main ape, Caesar has a HARD close-up, you cannot tell he is made by a computer. I recommend you see this in the theater if you have the chance. It is a great movie getting great reviews, and the effects are astonishing. Even if you don’t like creature features, go for the effects alone. Did you know that in all seven of the “Planet of the Apes” movies, not one giant hunk of poo-poo was flung? Not even a boogie…WTF?